Tommy “Deadman” Fisher was undoubtedly the most dangerous man in all the Western territories, wanted for robbery, kidnapping, and other crimes against man and nature. As his infamy grew, so too did his ambition. And it was that ambition that led him to undertake the most daring robbery of his criminal career: the heist at Kirkland Gulch. Set up: Up to three players assume the role of Fisher and his gang. The gang should secretly decide in advance on their robbery target(s). The bank, where much of the town’s savings can be found, definitely contains loot. There is also a shipment of newly-minted gold bars in town, but it is not clear whether these are at the assay office or the freight office. They also should designate a map edge as their escape route. One character may carry dynamite. The remaining players secretly choose their characters from among the Banker (who will appear in the bank, behind the counter), the Guard (who will appear in the freight office), the Prospector (who will appear within 3 hexes of the assay office), the Marshal (who will appear within 3 hexes of the Marshal’s office), or any of the townsfolk. Starting the game: The gang place their characters anywhere outside on the map, or up to one hex inside a front doorway. The townsfolk then reveal their identities and locations. The gang start with weapons drawn and cocked. Townsfolk start with them holstered or nearby within reach. Changing Characters: At the start of any turn, a member of the town (except the Marshal) may choose to change change characters. It is assumed that their previous character hides or runs away, and they draw a new character randomly from the deck. This new character will appear at the end of the turn at the appropriate location. Characters also automatically change characters when their current characters die or pass out. This may result in former gang players joining the town’s defenders. Thievery: To rob the bank, a gang member must spend 10 segments at the vault (BB-C8). To rob the assay office or freight office, a gang member must spend 5 segments at the safe (AA-Q6 or EE-Q7), at which point they can flip a coin to determine if the gold is present in that location or the other. Once located, the loot must be carried by the character. To reflect the additional burden, they draw a delay card at the start of each turn. Victory Conditions: The townsfolk win when all the gang are eliminated. The gang win if they escape the board with the loot. Tommy “Deadman” Fisher (aka “Gun Artist”) stepped into the bank, a pistol in each hand, and quickly fired off a shot at the startled Banker. 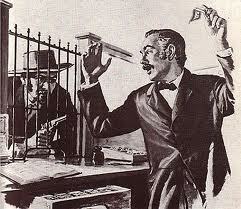 He missed, and the Banker ducked down behind the heavy wooden counter, reaching for his Winchester. Daryl “Big Chief” Cartier (aka “Axe”) stumbled into the bank too, bumped into his boss, and then inexplicably tripped over the door sill and threw himself on the floor, cursing loudly. Over at the freight office, the Guard heard the noise, grabbed his rifle, and ran outside. The Banker put his head up above the counter, and fired at Deadman. Misfire! The bandit fired with his second weapon, hitting the Banker in the gun hand and dropping him to the floor once more. The unfortunate townsman would soon pass away under a hail of fire from the two robbers. The Guard ran to the edge of the street, peered around the corner, and took aim with his rifle at the only exit from the bank. Elsewhere in town, the Old Man woke up in his shanty, thought about joining the fight, and decided against it. 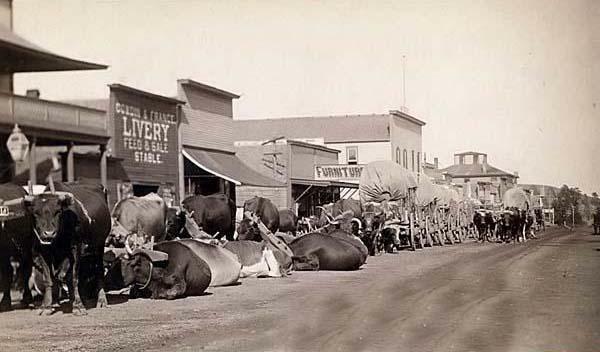 However, a Prospector in the assay office took up position in a window there, his rifle also trained on the front door of the bank across the street. Deadman ran to the vault, opened it, and loaded up with loot while Big Chief stumbled around the inside of the bank, undecided as to whether to wield a tomahawk or a shotgun. He finally decided to use the tomahawk, until he realized it might be difficult to throw it through the iron grill above the counter. He picked up his shotgun once more, and headed for the door. Finally the gang decided to make a run for it. Hooting and hollering, Big Chief was the first out the door. He didn’t get far: two shots rang out immediaterly, the first hitting the doorframe inches from his head, while the second grazed his side. He stumbled a bit, disoriented from the pain. His gang leader briefly contemplated shooting him in the back just for the fun of it. The Prospector fired a second shot, hitting Big Chief in the stomach. The badly wounded bandit threw himself to the dusty ground, hoping for shelter behind a nearby watering trough. Deadman then made his run for it. Two more shots rang out, but they were much less well aimed, and both went wide. Before the Guard and Prospector could draw bead on him again, he was safely around the corner of the bank, the contents of the vault in hand. The heist had been successful! 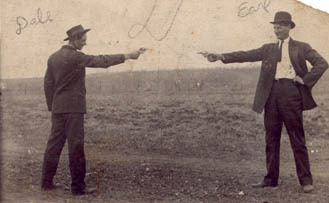 Newbie gunslinger : well sheriff, that thar man challenge me to a shootin’ duel. So I did what come nat’ral and sprinted at him. When I gt right close, I crouched at his feet an waved my gun in the air and shot straight up, wailin’ like a banshee straight outta tarnayshun! Next thing I knowed, the man’s clutchin’ at his chest, laughin’ n cryin’. Next thing I know, he done collapsed. N that how I won my first gunfight.